The members of the Triticeae tribe are characterised by the presence of orthologous and homoeologous gene copies regulating flavonoid biosynthesis. Among transcription factors constituting a regulatory MBW complex, the greatest contribution to the regulation of flavonoid biosynthetic pathway is invested by R2R3-Myb-type TFs. Differently expressed R2R3-Myb copies activate the synthesis of various classes of flavonoid compounds in different plant tissues. The aim of this research was the identification, comparison and analysis of full-length sequences of the duplicated R2R3-Myb Mpc1 (Myb protein c1) gene copies in barley and wheat genomes. The Mpc1 genes were identified in homoeologous group 4 and 7 chromosomes: a total of 3 copies in barley (Hordeum vulgare L.) and 8 copies in bread wheat (Triticum aestivum L.) genomes. All Mpc1 genes have a similar two-exon structure, and almost all of them are transcriptionally active. The calculation of the divergence time revealed that first duplication between 4 and 7 chromosomes of the common ancestor of the Triticeae tribe occurred about 35–46 million years ago (MYA); the last duplication arised about 16–19 MYA before the divergence Triticum and Hordeum genera The connection between gene expression and the appearance of anthocyanin pigmentation was found for three genes from homoeologous group 4 chromosomes: TaMpc1-A2 (5AL) in wheat coleoptile, HvMpc1-H2 (4HL) in barley lemma and aleurone layer, and HvMpc1-H3 (4HL) in barley aleurone layer. TaMpc1-D4 (4DL) from the wheat genome showed a strong level of expression regardless of the colour of coleoptile or pericarp. It is assumed, that this gene regulates the biosynthesis of uncoloured flavonoids in analysed tissues. The regulatory R2R3-Myb genes involved in anthocyanin synthesis were identified and characterised in Triticeae tribe species. Genes designated HvMpc1-H2 and HvMpc1-H3 appeared to be the main factors underlying intraspecific variation of H. vulgare by lemma and aleurone colour. TaMpc1-A2 is the co-regulator of the Mpc1–1 genes in bread wheat genome controlling anthocyanin synthesis in coleoptile. Myb (myeloblastosis) family proteins belong to a large class of transcriptional regulators found in all eukaryotic organisms [1, 2]. The first identified proteins with Myb domains were oncogene of avian myeloblastosis virus (v-myb) and its cellular homolog (c-myb) [3, 4]. Myb proteins regulate diverse cellular processes, including cells growth and differentiation, stress response and biosynthesis of secondary metabolites [5–9]. All Myb factors share the presence of imperfect Myb repeats (R), which are involved both in binding DNA and in protein-protein interactions. R2R3-Myb containing two Myb repeats constitute the largest group of plant transcription factors [6, 10, 11]. They play an important role as expression regulators involved in the biosynthesis of flavonoid pigments. Flavonoids are plants secondary metabolites derived from the general phenylpropanoids pathway (Fig. 1) [12, 13]. The name of these components is associated with the Latin word “flavus” meaning “yellow”. In addition to yellow, flavonoid pigments colour plant tissues in pink, red, blue, purple and brown. 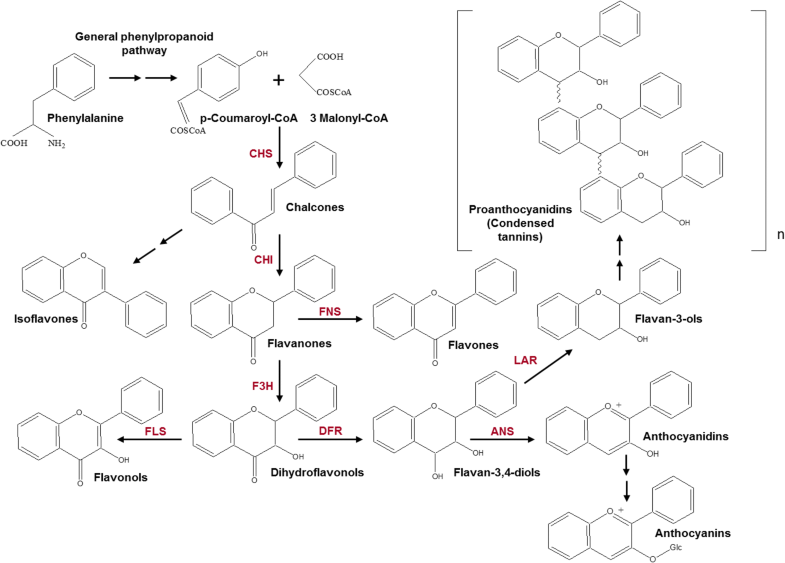 The pathway of flavonoid biosynthesis generates several main groups of compounds: chalcones, flavones, isoflavones, flavanones, flavonols, flavan-3-ol, proanthocyanidins and anthocyanins (Fig. 1). Flavonoids have a broad spectrum of functions in plants such as growth regulation, protection against abiotic stress factors, pathogenic microbes and pests, and attraction of pollinators and seed distributors [12–16]. Mutations in Myb genes often lead to decrease of flavonoid biosynthesis genes expression and to colourless phenotype. The Myb-type gene Colourless1 (c1, or Mpc1 – Myb protein c1) of maize located on chromosome 9 was the first identified gene encoding the transcription factor in plants . Mutants of this gene are characterised by the absence of anthocyanin pigmentation in the aleurone layer of maize kernels. In 1999, Li et al. have mapped a set of genes including Mpc1 by hybridization of maize and rice probes on DNA of wheat nulli-tetrasomic lines. Maize c1 homologs (named Mpc1) were detected in wheat chromosomes 4B, 4D, 5A and in homoeologous group 7 chromosomes . Later it was revealed that the loci on homoeologous group 7 chromosomes (7AS, 7BS, 7DS) contain the Myb-type TaMpc1 / TaC1 genes, which have a pleiotropic effect – regulation of the colour of the coleoptile and the pericarp [19–21]. In barley, c1 ortholog (HvMpc1 / HvAnt1) regulating anthocyanin synthesis in the leaf sheath and the pericarp was identified on chromosome 7HS [20, 22, 23]. Shin et al. have isolated CDS of the genes designated TaPL1 (1 copy on 4BL, 3 copies on 4DL chromosomes) presumably involved in the regulation of anthocyanin biosynthesis in wheat coleoptile. It was shown that TaPL1 is highly identical to HvMpc1-H2 / HvPL1 gene [24, 25]. The aim of the current study was the identification, phylogenetic analysis, as well as investigation of the structural and functional organisation of the Mpc1 gene copies encoding transcription factors (TF) R2R3-Myb-type in bread wheat (Triticum aestivum L.), its relatives (diploid and tetraploid wheat of the Triticum genus, as well as diploid species of the Aegilops genus related to the genomes B and D of bread wheat) and barley (Hordeum vulgare L.). Using the sequence of the T. aestivum TaC1 gene and the H. vulgare HvAnt1, eight gene copies in the bread wheat genome and three copies in the barley genome were found by BLAST searching (Table 1, the information about the chromosomal localisation of various Mpc1 genes was taken from IPK Barley BLAST Server for Hordeum contigs and International URGI database for Triticum and Aegilops contigs). One copy in barley 7HS chromosome and three copies in 7AS, 7BS and 7DS chromosomes of wheat were named HvMpc1-H1 and TaMpc1-A1, TaMpc1-B1, TaMpc1-D1 (Fig. 2) according to the rules for the designation of homoeologous genes . The root “Mpc1” instead if “C1” or “Ant1” was used in the gene names according to the first description and designation (Mpc1) of the C1 homologs in Triticeae tribe ). These genes have orthologs in di- and tetraploid species (Fig. 2, pink cluster). Five gene copies were found in the homoeologous group 4 chromosomes: one copy in 5AL (5A / 4A translocation region ), one copy in 4BL and three copies in 4DL (Table 1). Three of these genes represent the homoeologous set of Mpc1–2 genes: TaMpc1-A2 (5AL), TaMpc1-B2 (4BL) and TaMpc1-D2 (4DL) (Fig. 2, green cluster). This copy was preserved in related species, including barley – the gene HvMpc1-H2. Other copies named Mpc1–3 and Mpc1–4 were revealed in chromosomes 4 of the Triticeae tribe. 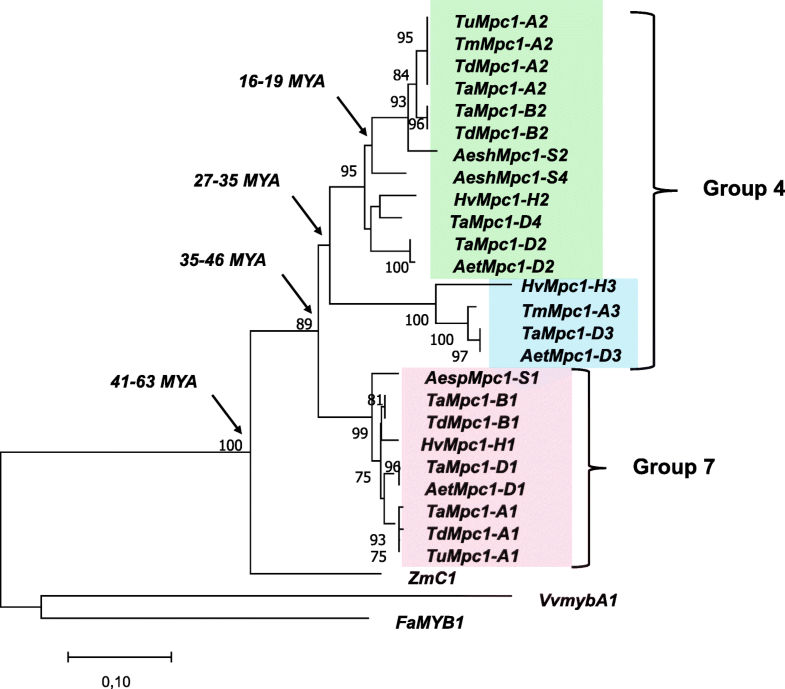 We identified TaMpc1-D3 gene of bread wheat and its orthologs in barley (HvMpc1-H3), Triticum monococcum and Aegilops tauschii genomes (Table 1, Fig. 2, blue cluster). The Mpc1–4 genes were found only in T. aestivum (TaMpc1-D4) and Aegilops sharonensis genomes (Table 1, Fig. 2, green cluster). The level of identity between Mpc1–1 and Mpc1–2, Mpc1–3 and Mpc1–4 nucleotide sequences is about 70%. The Mpc1–1 and Mpc1–2 clusters contain orthologous genes of both polyploid and diploid species of the Triticeae tribe, including donors of A, B and D genomes of T. aestivum and barley H. vulgare. Within these clusters, it is possible to trace the fact that the orthologous genes belonging to one subgenome (A, B or D) fall into one phylogenetic group with the exception of the genes identified in the genomes of Ae. sharonensis and Ae. speltoides (Fig. 2). Most likely, these genes are separated from the orthologous genes represented in the T. aestivum and T. durum genomes due to the fact that Ae. sharonensis and Ae. speltoides are not direct donors of the B-genome of polyploid wheat species (Ae. speltoides is considered to be the closest to the ancestor of the B-genome among the existing cereals . This dependence was not found in Mpc1–3 cluster due to its smaller size (Fig. 2). Apparently, the Mpc1–3 gene was most susceptible to pseudogenization in various members of the Triticeae tribe. We assumed that the Mpc1–1 and Mpc1–2 genes are the result of the duplication of the Mpc1 gene in the chromosomes 4 and 7 of the common diploid ancestor of the Triticeae tribe. The analysis of the genetic similarity of the Mpc1 genes and the calculation of the divergence time revealed that this duplication occurred about 35–46 million years ago (MYA) (Fig. 2). The Mpc1–3 gene copy occurred about 27–35 MYA due to segmented duplication in chromosome 4 of the common ancestor of the Triticeae tribe (Fig. 2). In addition, the Mpc1–2 gene was again duplicated in some genomes at least in the genome D and S resulting in appearance of the Mpc1–4 copy about 16–19 MYA before the divergence Triticum and Hordeum genera (approximately 9–11 MYA [29, 30]) (Fig. 2). In addition, we estimated the divergence time of Zea and Hordeum genomes. It occurred about 41–63 MYA, which is close to a known divergence time between these species – approximately 50–60 MYA . All identified genes have a site encoding the R2-R3 motif, which is characteristic for the R2R3-Myb subfamily. The exon-intronic structure for all the detected copies (Mpc1–1, Mpc1–2, Mpc1–3, Mpc1–4) is the same in all studied members of Triticeae tribe and consisted of two exons (Additional file 1). In the coding sequences of these genes only synonymous single nucleotide substitutions in all sequenced genotypes were detected. Analysis of the promoters of these genes (~ 600 bp from the start codon) revealed that all the identified sequences have many Myc- and Myb-binding motifs and light-dependent elements required for the flavonoids biosynthesis (Additional file 2). Also, in the promoter of HvMpc1-H3 some single nucleotide substitutions were revealed in BW, BA, PLP, OWB-Dom and OWB-Rec genotypes, as well as the 17 bp-insertion (CAGCAGAGCACTAGCTC) in the OWB-Rec genotype (Additional file 1). The expression of Mpc1–1 genes was studied earlier . Here we analysed the expression patterns of the TaMpc1–2, TaMpc1–3, TaMpc1–4 genes using gene-specific primers developed. TaMpc1-A2, TaMpc1-B2 and TaMpc1-D2 showed transcriptional activity in the coleoptile, TaMpc1-D4 gene was expressed both in the coleoptile and in the pericarp. All these genes were not transcribed in roots. In addition, the TaMpc1-D3 gene expressed neither in coleoptile nor the pericarp. Using quantitative RT-PCR we determined the relative level of genes expression in wheat cultivars and lines differing by anthocyanin pigmentation (Fig. 3, Table 2). It was shown that the level of expression of the TaMpc1-A2 gene correlates with the anthocyanin colouration of the coleoptile for almost all analysed wheat varieties. The TaMpc1-B2 gene shows a weak level of expression in the coleoptile of all analysed genotypes regardless of the pigmentation. The TaMpc1-D4 gene expression was also independent on coleoptile colour, but overall it was much stronger compared to that of TaMpc1-B2 (the 8th genotype, T.durum, is not considered in case of interpretation of the D-genomic gene’s expression, since it lacks the D-genome). The TaMpc1-D2 gene expression levels varied significantly among genotypes, however this variation was not related with the coleoptile colour. Also, we analysed the level of TaMpc1-D4 expression in pericarps of wheat lines, differing in the presence of dominant Pp-A1, Pp-D1 and Pp3 genes (TaMpc1-A1, TaMpc1-D1 and TaMyc-A1, respectively) controlling the anthocyanin biosynthesis in this tissue (Table 2). 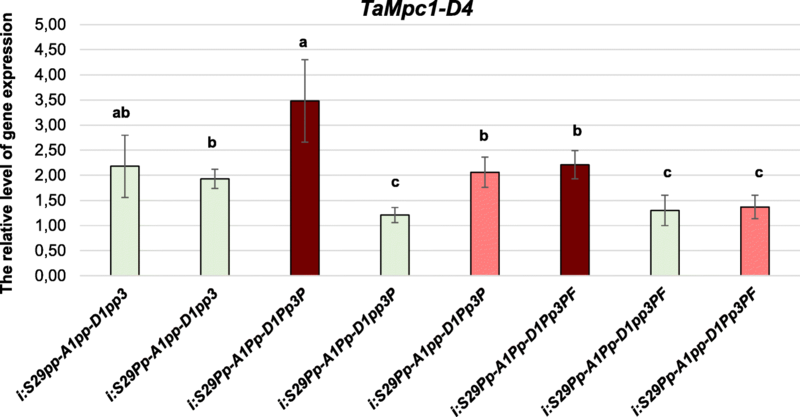 TaMpc1-D4 is expressed intensively in the pericarp of all genotypes possessing both pigmented and uncoloured pericarp (Fig. 4). The Mpc1-H2 gene expression was studied earlier . Here we investigated the relative levels of expression of the HvMpc1-H2 and HvMpc1-H3 genes in the aleurone layer, pericarp, lemma and stems of Bowman near isogenic lines (NILs) contrasting in anthocyanin pigmentation (Table 3). Both genes had very low activity in the pericarp. HvMpc1-H3 had in addition low activity in stems. HvMpc1-H2 was characterised by high transcriptional activity in the aleurone layer, lemma and stems, and its expression level correlated with the colour of the aleurone layer and lemma (Fig. 5). The highest expression level was detected in lemma in coloured NIL (PLP), which was 7 times higher than in uncoloured one (BW). HvMpc1-H3 has a high level of expression in the aleurone layer, and in the coloured aleurone (BA) the expression of this gene was ~ 8 times higher than in the uncoloured sample (Fig. 5). Also, this gene is expressed in the lemma of the analysed NILs. Interestingly, the expression of HvMpc1-H3 was 1.5 times higher in the uncoloured BW than in PLP. In addition to the chlorophyll colouration, plants organs could be coloured with polyphenolic flavonoid compounds. The biosynthesis of flavonoids is one of the most fully characterised plant metabolic pathways (Fig. 1). In the Triticeae tribe, the main structural genes encoding the enzymes of the flavonoid biosynthesis pathway are identified and localised [23, 32–34]. However, regulatory genes encoding Myb, bHLH/Myc and WD40 transcription factors (forming the MBW complex) are poorly studied. These factors provide tissue-specific expression of structural genes, and, consequently, tissue-specific accumulation of flavonoid pigments. In this study, we carried out the identification and characterization of R2R3-Myb-coding genes, potentially involved in the biosynthesis of flavonoids in Triticeae tribe. To date, the genes encoding TF R2R3-Myb-type associated with anthocyanin biosynthesis and localised in homoeologous group 7 chromosomes (TaMpc1–1 in the wheat chromosomes 7A, 7B and 7D and HvMpc1-H1 in the barley chromosome 7H ). However, the data obtained earlier with Southern blot analysis on wheat nulli-tetrasomic lines  indicated the presence of homologs of the Mpc1 genes in homoeologous group 4 chromosomes. Using the sequence of the Mpc1–1 genes, 5 additional gene copies in 5A, 4B and 4D chromosomes of bread wheat and 2 additional copies in 4H chromosome of barley were identified. We demonstrated these genes to be divided into three main clusters, with Mpc1–3 cluster being the smallest (Fig. 2). Apparently, Mpc1–3 genes were the most susceptible to pseudogenization and to elimination from the genomes in Triticeae tribe. It is known that the Mpc1–1 genes are specific regulators of anthocyanin pigments biosynthesis [23, 32]. We determined the expression of previously unstudied Mpc1–2, Mpc1–3 and Mpc1–4 genes. It was shown that almost all Mpc1 genes are transcriptionally active, and they are characterised by a tissue-specific expression pattern. The fact that none of the Mpc1 genes of wheat is expressed in the roots indicates that probably there are other R2R3-Myb encoding genes in T. aestivum genome with a lower homology level providing the flavonoids biosynthesis in the roots. An interesting fact was noted for TaMpc1-A2 – its expression is associated with the colouration of coleoptile of bread wheat (Fig. 3). Potentially the transcript of this gene was previously detected and cloned from the wheat cultivar Iksan370, which preferentially expresses anthocyanins in coleoptiles , since none of the other Mpc1–2, Mpc1–3 and Mpc1–4 gene has demonstrated a correlation with the colouration of this tissue. It is known that the colour of coleoptile (as well as the colour of pericarp) is provided by the presence of dominant Mpc1–1 genes mapped to homoeologous group 7 chromosomes [19–21]. TaMpc1-A2 may be involved in the synthesis of uncoloured anthocyanin precursors in wheat coleoptile as a co-regulator of the Mpc1–1 genes. TaMpc1-D4 could be another regulator of uncoloured flavonoid compounds biosynthesis both in coleoptile and in pericarp (Figs. 3, 4). Barley pigmentation of stems and pericarp is known to be associated with the dominant HvMpc1-H1 [19, 21]. Probably, the expression of this gene causes tissue-specific suppression of HvMpc1-H2 and HvMpc1-H3 genes in the pericarp and suppression of HvMpc1-H3 in the stems (Fig. 5). HvMpc1-H2 is probably the main regulator of the appearance of anthocyanin pigmentation in the barley lemma. It is likely that the overexpression of HvMpc1-H2 in the lemma suppresses the expression of HvMpc1-H3 in the lemma of coloured PLP line (Fig. 5). The blue colour of the aleurone layer depends on five complementary Blx (Blue aleurone xenia) genes. Three of these genes (Blx1, Blx3, Blx4) are closely linked to each other and were mapped to chromosome 4HL . It was previously revealed that Blx3 and Blx4 appear to be bHLH-coding gene HvMyc2 and Cytochrome P450-coding HvF3’5’H . HvMpc1-H3 is apparently the co-regulator of anthocyanin pigments accumulation in the barley aleurone layer (Fig. 5). In addition, the presence of a mutation in genotype OWB-Rec (insertion of 17 bp) was identified in the promoter of HvMpc1-H3 (Additional file 1). If this gene is the missing R2R3-Myb component of the MBW complex initiating anthocyanins synthesis in the aleurone layer, then this mutation in HvMpc1-H3 with previously identified mutation in HvMyc2 in OWB-Rec genotype could be a reason of a digenic inheritance in blue colouration of the aleurone layer in OWB population . Potentially, HvMpc1-H3 is the third Blx gene (Blx1) from the 4HL chromosome. R2R3-Myb-coding genes involved in flavonoid synthesis in Triticeae tribe were identified and characterised, from which TaMpc1-A2 is the co-regulator of the Mpc1–1 genes in bread wheat genome controlling anthocyanin synthesis in coleoptile. HvMpc1-H2 and HvMpc1-H3 appeared to be the main factors underlying variation of barley lemma and aleurone colour, respectively. The search of homologous sequences of Mpc1 gene was made in databases for wheat (International URGI database, https://urgi.versailles.inra.fr) and barley (IPK Barley BLAST Server, http://webblast.ipkgatersleben.de/barley_ibsc/) sequences using BLASTN. Barley gene HvMpc1-H1 (GenBank: KP265977) and wheat genes TaMpc1–1 (GenBank: AB983540, AB983541, AB983542) were used to identify Mpc1 sequences in barley and wheat genome, respectively. The exon-intronic structure of the genes was predicted with FGENESH+ software (http://www.softberry.com/berry.phtml?topic=fgenes_plus&group=programs&subgroup=gfs) using polypeptide sequence of homologous gene HvMpc1-H1. The sequences were aligned using Multalin (http://multalin.toulouse.inra.fr/multalin/). The construction of the Neighbour-joining tree was performed using MEGA v5.1 software (http://www.megasoftware.net) with 1000 bootstrap replicates to assess the branch support. Promoters of the genes were analysed with New PLACE database (https://sogo.dna.affrc.go.jp/cgi-bin/sogo.cgi?lang=en&pj=640&action=page&page=newplace). The Ks parameter (the frequency of synonymous substitutions) was estimated using modified Nei–Gojobori method . The rate of nucleotide substitution accumulation (k = 3.2 × 10− 9) was calculated with the formula Ks/2 T according to  using 10 MYA as the average time of barley and wheat divergence. The average Ks value was calculated using Ks(HvMpc1-H1/TaMpc1-A1) = 0.089, Ks(HvMpc1-H1/TaMpc1-B1) = 0.044 and Ks(HvMpc1-H1/TaMpc1-D1) = 0.059. The divergence time were calculated for the remaining genes according to the formula T = Ks/2 k.
Plant material included three Bowman’s near-isogenic lines (NILs) and two parental lines (OWB-Dom and OWB-Rec) of barley H. vulgare (HH), one tetraploid line of the T. durum (BBAA) and sixteen lines and cultivars of the hexaploid wheat T. aestivum (BBAADD) (Tables 2, 3). The three NILs, T. durum line and sixteen T. aestivum cultivars and lines were exploited for gene expression analysis. CS, S29, OWB-Dom, OWB-Rec, BW and BA were also used for sequencing. The experiments were conducted in three replicates for each genotype. The plants for DNA extraction and RNA extraction from stems, aleurone layers, pericarps and lemmas were grown in ICG Greenhouse Core Facilities (Novosibirsk, Russia) under а 12 h of light per day at 20–25 °C. Seeds for RNA extraction were germinated on moist filter paper in the climatic chamber “Rubarth Apparate” (RUMED GmbH, Laatzen, Germany) under a 12 h photoperiod at 20 °C. Total genomic DNA was extracted from fresh leaves following . Wheat and barley pericarps and barley aleurones were cut out with a scalpel from grains at early dough stage maturity for RNA extraction. RNAs from wheat coleoptile samples (fifth day after germination), barley lemmas, stems (collected at the end of flowering) and pericarps were extracted using a ZR Plant RNA MiniPrep™ (Zymo Research, USA), RNAs from aleurone layers were extracted using a RNeasy Mini Kit (QIAGEN, Germany) according to the manufacturer’s instructions. All isolated RNAs were treated with RNase-free DNase set (QIAGEN, Germany). To obtain single-stranded cDNA samples total RNA was converted in a 20-μL reaction mixture from a template consisting of 0.4 μg of total RNA using a RevertAid First Strand cDNA Synthesis Kit (Thermo Fisher Scientific Inc., USA). Gene-specific primer pairs were constructed using OLIGO 7 software based on sequences found in IPK Barley BLAST Server and International URGI database (Table 4). PCR was performed in a 20-μL reaction mixture containing 75 ng of gDNA or cDNA, 0.2 mM of each dNTP, 1.5 mM MgCl2, 67 mM Tris-HCl pH 8.8, 0.01% Tween 20, 18 mM (NH4)2SO4, 1 ng of each primer and one unit of Taq DNA polymerase (Medigen Ltd., Russia) with the following profile: 1 cycle at 94 °C for 2 min; 35 cycles at 94 °C for 1 min, 50–60 °C for 1 min, 72 °C for 2 min; 1 cycle at 72 °C for 5 min. The qRT-PCR was based on a SYNTOL SYBR Green I kit (Syntol, Moscow, Russia) with the primers from Table 4. The reference sequence was ubiquitin, primers were suggested in . The amplifications were performed in an ABI Prism 7000 Sequence Detection System (Applied Biosystems, http://www.lifetechnologies.com). Each sample was run in three technical replications. PCR products were separated in 1% agarose gel. The amplified fragments were purified from an agarose gel using a DNA Clean kit (BioSilica, Novosibirsk, Russia). We thank Mrs. Tatiana Kukoeva (ICG, Novosibirsk, Russia) for technical assistance. The sequences obtained in the current study are available at NCBI: MH753559-MH753569. Publication costs are funded by the Russian Science Foundation (project No 16–14-00086). Growth of barley plants in the ICG Plant Growth Core Facility was supported by ICG project 0324–2018-0018. KVS carried out all in silico analysis, molecular-genetic experiments and statistical analysis, contributed to the interpretation of data and participated in drafting the manuscript. EKK contributed to the design of the study, to interpretation of data and to revising the manuscript. All authors read and approved the final manuscript. Hong JC. General aspects of plant transcription factor families. Plant Transcription Factors. 2015:35–56. https://doi.org/10.1016/B978-0-12-800854-6.00003-8. Landi M, Tattini M, Gould KS. Multiple functional roles of anthocyanins in plant-environment interactions. Environ Exp Bot 2015;199:4–17. https://doi. org/https://doi.org/10.1016/j.envexpbot.2015.05.012. Shoeva OY, Strygina KV, Khlestkina EK. Genes determining the synthesis of flavonoid and melanin pigments in barley. Vavilovskii Zhurnal Genetiki i Selektsii (Vavilov J Genet Breed). 2018;22(3):333–342. doi:https://doi.org/10.18699/VJ18.369. Salse J, Abrouk M, Bolot S, Guilhot N, Courcelle E, Faraut T, Waugh R, Close TJ, Messing J, Feuillet C. Reconstruction of monocotelydoneous proto-chromosomes reveals faster evolution in plants than in animals. PNAS 2009;pnas-0902350106. doi:https://doi.org/10.1073/pnas.0902350106. Khlestkina EK, Shoeva OY, Gordeeva EI. Flavonoid biosynthesis genes in wheat. Russ J Genet Appl Res. 2015;5(3):268–78. https://doi.org/10.1134/S2079059715030077. Adzhieva VF, Babak OG, Shoeva OY, Kilchevsky AV, Khlestkina EK. Molecular-genetic mechanisms underlying fruit and seed colouration in plants. Vavilovskii Zhurnal Genetiki i Selektsii (Vavilov J Genet Breed). 2015;19(5):561–573. doi:https://doi.org/10.18699/VJ15.073.